Yamaha Motor increases equity share in Indian joint venture motorcycle manufacturer Yamaha Motor will assume overall management from June 1, 2000 - News Releases | Yamaha Motor Co., Ltd. Recently, Yamaha Motor Co., Ltd. and its joint venture partner in India, Escorts Limited (Chairman and Managing Director : Mr. Rajan Nanda. Location: Faridabad, suburbs of New Delhi) concluded a contract calling for Yamaha Motor Co., Ltd. to increase its equity share in the motorcycle manufacturing and marketing venture, Escorts Yamaha Motor Ltd. (EYML), from the present 50% to 74%. In the agreement, Yamaha Motor Co., Ltd. will also take over management of EYML manufacturing, marketing, technical and administration activities from June 1, 2000. Yamaha's investment increase will take the form of a stock deal, in which Escorts Limited transfers a portion of its 50% share in EYML to Yamaha Motor. With the stock acquisition, Yamaha increases its equity share to 74%, while the Escorts Limited interest falls to 26%. Capitalization remains unchanged at 270 million rupees (approximately 6.2 million U.S. dollars). The company name will be changed to Yamaha Motor Escorts Limited (YMEL). Yamaha will bring global expertise in manufacturing, marketing, and technology to the management of YMEL, seeking to strengthen its competitive edge in both the Indian market and the export business. In the production plan under the new management, the lineup of 4-stroke models, as well as present mainstay 2-stroke models, will be expanded and improved. Meanwhile, annual production and sales targets will be increased by 20%, to approximately 300,000 units in the year 2000 (the first year of the plan), and to 440,000 units in three years. In 1985, Yamaha Motor entered into a technical support agreement with Escorts Limited, and started local production of Yamaha brand motorcycles. 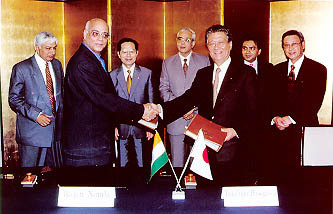 Yamaha and Escorts subsequently concluded another contract, in 1995, establishing EYML to manufacture and market motorcycles in India. Each company invested 50% of the capital for the original venture. India is the second largest motorcycle market in the world, with annual demand of approximately 3.8 million units. Moreover, the annual demand is expected to grow to 4.4 million units in 2003. By increasing its ownership in the joint venture, Yamaha will be able to speed up the development, production, and marketing of motorcycles that precisely meet customer needs in this rapidly growing market. In addition, Yamaha can continue to enhance YMEL as a cross-trade base, thus expanding motorcycle markets worldwide. * Rupee amounts are translated solely for convenience at 1 rupee = 0.023 U.S. dollar.